I got to Meresands Wood yesterday 11/11/10 with the strong and building winds, birdlife was keeping low with the view towards Martin Mere revealing pink feet being blown over the sky. 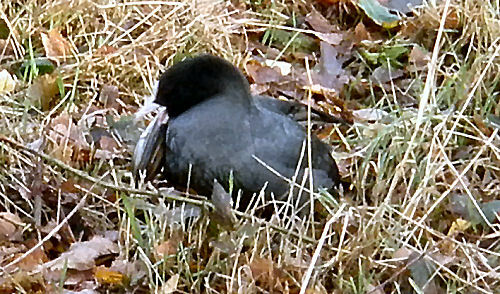 However on reaching the Rufford hide I noticed a coot swimming towards the bank in a strange manner, it then climbed onto the bank and appeared to carrying what I first took to be a water vole/shrew. On closer inspection the object turned into a large swan mussel which was firmly clamped to the lower mandible of the bird, the coot lay down in the grass and appeared quite weak so this situation must have in place for some time, preventing the bird from feeding. After a while the coot returned to the water and wether it ever manged too release the mussel I don’t know, but unless it did it was likely to become a victim of this strange underwater predator.